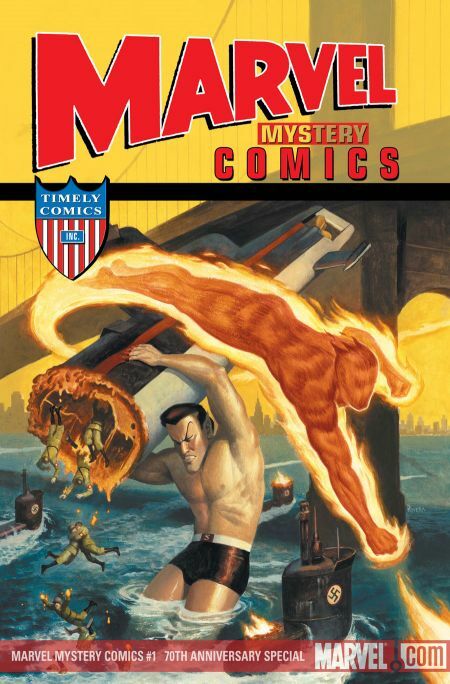 Marvel continues their 70th Anniversary celebration with Marvel Mystery Comics #1, featuring two of Marvel’s most popular Golden Age heroes, Namor the Submariner and The Human Torch. They are joined by The Torch’s young sidekick, Toro, speculated to, perhaps, be Marvel’s first mutant hero, The Angel, a non-super powered adventurer, and The Ferret: Mystery Detective, a detective whose sidekick is his preternaturally prescient pet ferret. No, that’s not a joke. He, literally, walks around with, and gets out of jams with the help of his pet ferret. In the first tale, written by Tom Defalco, Namor, The Human Torch, Toro, The Angel, Ferret, and Betty Dean, Namor’s policewoman friend, team up to battle Dr. Manyac, his Nazi cohort, Herr Gaufman, and their small army of Green Flames. The Green Flames are robots who generate a flame that burns freezing cold. Their cold flame is powerful enough to challenge The Torch and Toro. Turns out, Manyac and Gaufman have an even bigger surprise in store for the heroes as Project: Blockbuster forces Namor and The Torch, specifically, to set aside their differences, and make use of their unique abilities, in tandem, if they are going to have a chance at defeating the new threat. We also catch a glimpse of Electro: The Marvel of The Age in action. Electro, a “powerful mechanical man,” is a construction of Professor Philo Zog, a mechanical genius that Dean and Ferret have been searching for, as he has disappeared, and is a prisoner of Manyac and Gaufman. Defalco does a good job juggling these characters, and bringing them together, in this short, but action packed tale. He portrays, particularly well, Namor and The Torch’s conflicts of personality, which are driven by Namor’s arrogance and distrust of The Torch. It’s an interesting dynamic. Each hero displays a personality that is at odds with their elemental and physical natures. The Human Torch, who is literally a walking, flaming, heat producing, master of fire, is the cool headed one. Namor, an ocean depth dwelling being, who is at home in his natural element of the cold ocean depths, is the hot head. The two opposites don’t mix well, much like fire and water battle each other often in nature. It is these two who receive the most attention, and are the most well developed characters. Ferret doesn’t do much more than his obvious sleuthing, and The Angel doesn’t do much more than bust up a ring of Nazi spies. They both do assist in the final battle, though. Overall, the story is an entertaining one, even if the lesser known characters don’t get much development. They do lend a worthy hand. Burnham’s art captures the period well. Like the rest of the 70th Anniversary Specials, this one is set in the late 1930’s. His version of Namor is classic in its looks, as is his Torch. The Green Flames and Project: Blockbuster both have a look, much like The Torch did in his Special, of steam-punk tech, just a few decades later and advanced from steam-punk’s historical and fictional setting. All the elements of Burnham’s art come together to form a visually engaging finished product with Fairbairn’s colors putting the finishing touches on. The backup tales, both being reprints from Marvel Mystery Comics #4 and #5, published in February and March of 1940, chronicle The Torch’s first battle with Manyac and his Green Flames, and an adventure of Ferret’s. I guess, for modern readers, it’s a little hard to not chuckle at a character whose pet ferret, named Nosey, gets him, a grown man and adventurer/detective, out of trouble, but it’s an interesting look back at a simpler age of comic book storytelling. The Torch’s tale, while still being obviously a simpler story than most modern readers are used to in its sophistication, is more interesting than Ferret’s. It gives us a look at the main tale’s villains as originally conceived. The Torch has been getting a great deal of attention lately, and has been popping up quite a bit in the pages of Marvel’s 70th Anniversary Specials, and even in Captain America, in flashbacks sequences. Is Marvel testing the waters for an Original Human Torch return? With the recent Human Torch Comics 70th Anniversary Special #1 giving us, perhaps the best story out of all the Specials thus far, it’s been shown that quality stories can be told about him. So, why not bring him back? 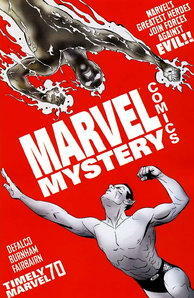 Overall, Marvel Mystery Comics 70th Anniversary Special #1 is another in a line of great reads from Marvel, celebrating 70 years of Marvel Comics. While it isn’t quite the stand out issue that The Human Torch’s issue was, it’s definitely a fun read.